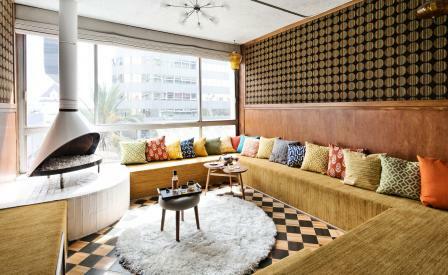 When it opened just over a year ago The Line hotel in Los Angeles’ Koreatown, quickly became a neighbourhood hotspot thanks to its stellar team that included K-town native, chef Roy Choi and nightlife impresarios Jonnie and Mark Houston. Housed in the iconic building designed by architects Daniel Mann Johnson + Mendenhall in 1964, the hotel’s stylish interior is down to local design collective Poketo, who embellished the original stark concrete bones with a stylish mix of modern furniture, standout prints and bold colours. Now, the Houston brothers have launched five new suites that pay homage to the family patriarch, who moved his brood to Koreatown around the time the hotel was originally built. Inspired by the distinct prints and dark green, brown and orange hues of the 1960s and 70s, the rooms are a nostalgic throwback that showcases shag rugs, Malm-style fireplaces and graphic wallpaper. Highlights include a dedicated concierge, in-room Karaoke and a personalised mini-bar, making it the perfect space to hold an impromptu bash.